You know how sometimes when you’re in social situations you can’t help but eavesdrop on other people’s conversations? Sometimes I don’t have enough drama in my life, so I must live vicariously through others. Don’t judge, you do it too. Anyway, the other day I had an independent lunch meeting, meaning I was eating lunch by myself. There were three women sitting at the booth behind me. One was recently engaged and, I’m assuming, the other two would have roles within the wedding party. The number of topics covered within the 30 minutes were anything from spouses, food, workouts, the wedding, work, coworkers, family, etc. One voice, we’ll call her Sally, stuck out more so than the other two. It seemed like everything she said had some sort of negative connotation. In short, she was unhappy with her appearance, her mother was unsupportive of her job and husband, she didn’t get along with her sister, her kids were constantly misbehaving, the women at work were mean and it was affecting her job enjoyment. The other two women couldn’t even try to give her advice. Everything was met with adversity, almost as if she wanted to stay in a negative space. As I’m listening, the word TOXIC kept coming to my mind like a flashing sign. I’m not talking about her being a toxic friend. As far as I know, she may be a very trustworthy, caring friend who just needs to vent. Maybe not. Whatever the case may be, the one thing I know for sure is she’s suffering from some degree of toxicity. 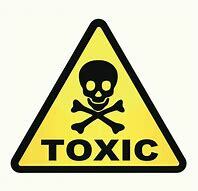 The word toxic is defined as poisonous, denoting or relating to debt which has a high risk of default. Toxicity is the degree to which a toxic substance can harm humans or animals. A toxic person is described as someone who is deeply wounded and for whatever reason, they are not yet able to take responsibility for their wounding, their feelings, their needs and their subsequent problems in life. No, this is not a vocabulary lesson. But what I want to bring to your attention is the idea that Sally’s thoughts are the toxic, poisonous “substance” which, at an elevated degree manifest as words that make her a toxic person. So why is this a big deal? Why am I picking on Sally? Honestly, it made me reflect on the amount of toxic thoughts I have toward myself and situations or people in my life. We all do it. Constant negativity, constant excuses, and a lack of desire to change our behavior is simply manifested toxicity. We must start asking ourselves a series of questions. What do you want to come from the situation or relationship? What are you going to do about your problem? How are you going to take steps to change your behavior? Why is this important to you? Thoughts breed actions. If you truly want to be happy, you must change your thoughts. You must change the way you think about yourself and the people around you constantly looking for the positive side. As hard as that may be, trust me, there is a brighter side. So how does this relate to nutrition, weight loss, and everything else I’m “supposed” to talk about? Think about how many times you have prevented yourself from having success because of self doubt or because you don’t think you are deserving. How many times have you logged into any social media site and wished you had someone else’s genetics and allowed yourself to feel bad about your own genetics? Think about every time you have a stressful day at work and allow that stress to ruin your ability to make a good decision with food. The list goes on, but they all have to do with the emotional ruin that follows toxic thoughts. If you are unable to compartmentalize your emotions from food, then like most people, you end up eating your feelings. STOP THE MADNESS. When we learn how to separate our emotion from food, we will have success. Deal with your problems in the manner that they must be dealt with. If hunger is not the problem, food is not the answer. So, when Sally’s gets into an argument with her Mom about whatever, food isn’t going to solve the problem. In fact, it might make matters worse. She eats something she regrets, has immediate remorse, and it exacerbates her irritability. That’s a vicious cycle to which I’m sure we all can relate. My challenge to you is to test your level of toxicity. Practice becoming mindful of the negative thoughts that run through your head. How many times a day do you complain about something? I recently watched a video of a young boy making the comment about practice. “What do you practice” was his premise. Whatever you practice, you’re going to get really good at. If you practice complaining or negativity, you’ll get really good at it. If you practice gratitude and positivity, guess what? The point is, whether food, friends, spouse, and especially self, positivity attracts positivity. Toxic elements can be cleaned up; it just might take some elbow grease!